The Aztec Ruins National Monument is a large archaeological site situated in New Mexico, United States. The site features a number of structures constructed by Ancestral Puebloans between the 11th and 13th centuries. The ruins are at a distance of ten miles from the nearby town of Aztec and were declared a part of the Aztec Ruins National Monument in 1923. The site was also declared a World Heritage site in 1987 and has long been preserved. The Aztec ruins at this famous site belong to the period between 11th and 13th centuries and comprise of numerous buildings. The structures were constructed by Ancestral Puebloan people, who were ancestors to the modern-day Pueblo Indians. 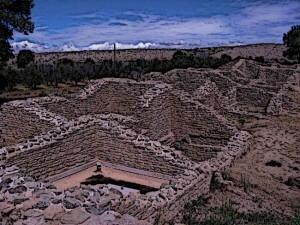 According to the archaeological researches done during the 20th century, the site was abandoned by Ancestral Puebloans towards the close of the 12th century. The original inhabitants of the site moved away to Rio Grande valley and certain areas of Arizona after abandoning this site. Researchers surmise that the site was abandoned after the local population faced adverse environmental factors which significantly impacted local agriculture. The name of these ruins can be quite misleading since it makes a mention of the Aztec. However, Aztec were a people who lived in Mesoamerica in the Valley of Mexico. The exact region where the Aztecs lived is today Mexico, and specifically the Mexico city which is built on top of the Aztec city of Tenochtitlan. Early settlers at the site in the 19th century took the ruins to be related to the Aztec people and gave them the same name. Although a mistake, the name stuck and is now a part of the official name of these ruins. The style of structures extant at the site of the Monument is unique. 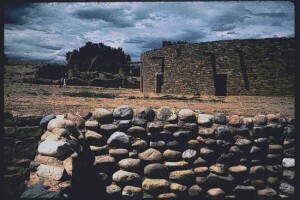 Ancestral Puebloans made use of sandstone, mud and stones to prop up their buildings. The extant structures among the ruins include a large walled village with as many as 400 rooms. The rooms are constructed on three different levels and they are built on top of circular kivas, which were the ceremonial areas of the Pueblo inhabitants. One of such structures is called the Great Kiva, a 50-feet wide circular area which was rebuilt in 1934 along the original outlines. The modern-day ruins of the site include many remarkable pieces of original stone masonry and wood roofing as part of the extant structures. Aztec National Monument Aztec Ruins – The site of the ruins was first discovered in 1859. The ruins were in a dilapidated state and had been covered by sand for the most part. The site of the ruins was first discovered in 1859. The ruins were in a dilapidated state and had been covered by sand for the most part. Despite the discovery in 19th century, the site remained abandoned and it was frequently looted. In the first half of the 20th century, a serious attempt was made to revive the site and undertake archaeological excavation. In 1923, after a period of excavations at the site, its status as a National Monument was established and this gave the place protection under the U.S. government. Later in 1987, the ruins were categorised as a World Heritage Site under UNESCO.